1. Reduction of a process to a standard or type; such as, making something typical or in compliance with a model or a principle which has been established: The new legislation was designed to impose a normalization of the school curriculum. 2. Any process that makes something more conventional, which typically means conforming to some regularity or rule, or returning from some state of irregularity: Many of the principles of social work are intended to bring some normalization to the lives of clients who have been disturbed by a crisis. 1. The act of making something legally invalid, counteracting, or overriding the effect or force of something. 2. The act of canceling something out. 3. The refusal by a state government to allow the application of a section of federal law. 4. In U.S. history, a doctrine expounded by the advocates of extreme states' rights which held that states have the right to declare null and void any federal law that they deem unconstitutional. Calculations or processes of tallying, reckoning, or assigning a quantum to something: Numerations involve a system of reading or naming numbers: especially, those written decimally and usually according to the Arabic numerals. Numeration can be an action, a process, or a result of ascertaining the number of people, etc., in a specified category. The act or process of eating properly: The best nutrication one can have is to provide energy as a developing elelment in order to help maintain or to repair body parts and to support better growth and development of one's physical structure. The nutrication of the farmer's cows had to be properly supervised in order to ensure that they received the best possible fodder possible for the best milk. 1. A confusion resulting from failure to understand; bewilderment, disorientation: When the doctor was trying to explain Fern's medical condition, there was much more obfuscation and confusion than understanding about what could be done to improve her ailment. 2. An activity that leaves people baffled or bewildered and being without understanding: It was difficult for the audience to comprehend what the politician was trying to say because of his obfuscation regarding how he would improve the economy. 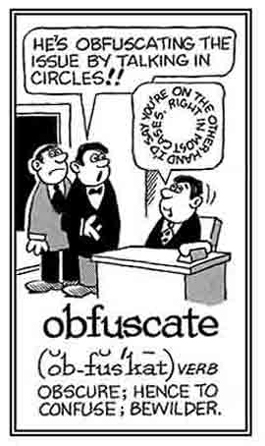 Although this cartoon refers to a verb, it is used here to help you understand the meaning of this noun entry. 1. The act of binding oneself by a social, legal, or moral tie. 2. A social, legal, or moral requirement; such as, a duty, contract, or promise that compels one to follow or avoid a particular course of action. 3. A course of action imposed by society, the law, or one's conscience by which a person is bound or restricted. 4. The constraining power of a promise, contract, law, or sense of duty. 5. In law, a legal agreement stipulating a specified payment or action; especially, if the agreement also specifies a penalty for failure to comply and the document containing the terms of such an agreement. 6. Something owed as payment or in return for a special service or favor for which one is indebted to another. 7. The state, fact, or feeling of being indebted to another for a special service or favor received. 8. Etymology: from Old French obligation (1235), from Laton obligationem, obligatio, "an engaging" or pledging"; literally, "a binding" (but rarely used in this sense), noun of action from obligare. The meaning is of "binding with promises" or "by law" or "duty". Oblige, with which it is usually confused, means "to do one a favor". A struggling or striving against; a resistance. 1. A clouded mental state or condition. 2. A lowered level of consciousness; for example, with a loss of the ability to respond properly to external stimuli. Showing page 67 out of 96 pages of 1437 main-word entries or main-word-entry groups.